This First Look helps you develop REST interfaces. You can use these REST interfaces with UI tools, such as Angular, to provide access to databases and interoperability productions. You can also use them to enable external systems to access InterSystems IRIS Data Platform™ applications. If you need access to the data in an InterSystems IRIS™ database from an external system or want to provide a user interface for that data, you can do it by defining a REST interface. REST  or REpresentational State Transfer  is a way to retrieve, add, update, or delete data from another system using an exposed URL. REST is based on HTTP and uses the HTTP verbs POST, GET, PUT, and DELETE to map to the common Create, Read, Update, and Delete (CRUD) functions of database applications. You can also use other HTTP verbs, such as HEAD, PATCH, and OPTIONS, with REST. REST typically has a small overhead. It typically uses JSON which is a light-weight data wrapper. JSON identifies data with tags but the tags are not specified in a formal schema definition and do not have explicit data types. REST is typically much simpler to use than SOAP, which uses XML and has more overhead. By defining an interface in REST, it is easy to minimize the dependencies between the client and database server. This allows you to update your user interface without impacting your database implementation. You can also update the database implementation without impacting the user interface or any external applications that access the REST API. GET  this is the http verb. http:  this specifies the communication protocol. //localhost:52773  this specifies the server and port number of the InterSystems IRIS instance hosting the REST interface. /rest/coffeemakerapp/coffeemakers  this is the main part of the URL that identifies the resource that the REST call is directed to. In the following discussion, URL refers to this part of the REST call. Although this First Look uses the web server installed with InterSystems IRIS (using port 52773), you should replace it with a commercial web server for any code that you deploy. The web server installed with InterSystems IRIS is intended only for temporary use in developing code and does not have the robust features of a commercial web server. InterSystems IRIS directs it to the web application that corresponds to the URL. For example, a URL starting with /coffeemakerapp would be sent to the application handling coffee makers and a URL starting with /api/docdb would be sent to the web application handling the Document Data Model. The web application directs the call to a method based on the HTTP verb and any part of the URL after the section that identifies the web application. It does this by comparing the verb and URL against a structure called the URLMap. The method uses the URL to identify the resource that the REST call is specifying and performs an action based on the verb. For example, if the verb is GET, the method returns some information about the resource; if the verb is POST, the method creates a new instance of the resource; and if the verb is DELETE, the method deletes the specified resource. For POST and PUT verbs, there is typically a data package, which provides more information. The method performs the requested action and returns a response message to the client application. Defining the web application  you typically do this using the Management Portal. The section “Trying to Define a REST Interface for Yourself” describes how to do this. Creating a subclass of %CSP.REST and defining the UrlMap. Coding the methods that handle the REST call. This First Look uses a sample application, coffeemakerapp, that accesses a database of coffee makers. Each record describes a coffee maker, including information such as its name, brand, and price. 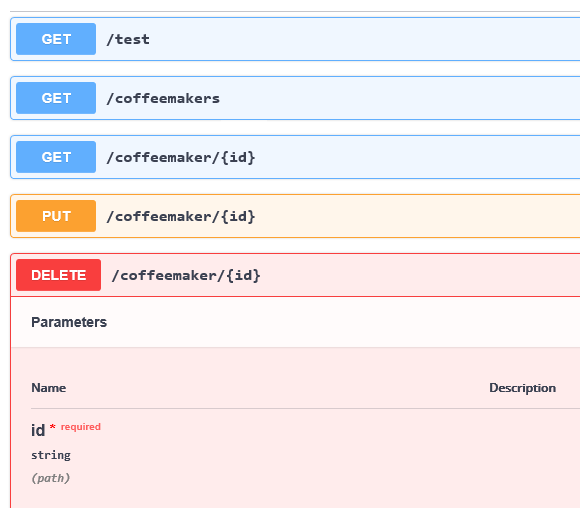 The coffeemakerapp provides REST interfaces to get information about the coffee makers, create a new record in the database, update an existing record, or delete a record. In a later section, this First Look tells you how to get the sample code from https://github.com/intersystems/FirstLook-REST. Here is the first part of the demo.CoffeeMakerRESTServer class definition. It extends the %CSP.REST class. Url  this identifies the REST URL that can be handled by this Route. Since IRIS directs URLs starting with /rest/coffeemakerapp, this property specifies the part of the URL immediately after that. If the Url property is /coffeemakers, this Route handles URLs starting with /rest/coffeemakerapp/coffeemakers. Method  this identifies the verb that the Route handles. Note that the last two lines have the same value for Url, /coffeemaker/:id. The Route with the PUT method will handle PUT verbs with a URL starting with /rest/coffeemakerapp/coffeemaker/:id and the Route with the DELETE method will handle DELETE verbs with the same starting URL. Call  specifies the method to call to process this REST call. The method is passed the complete URL and any data so it can base its response on the URL. The part of the Url value that starts with a : represents a wildcard. That is /coffeemaker/:id will match /coffeemaker/5, /coffeemaker/200, and even /coffeemaker/XYZ. The called method will get passed the value of :id in a parameter. In this case, it identifies the ID of the coffee maker to update (with PUT) or delete. The Url value has additional options that allow you to forward the REST URL to another instance of a %CSP.REST subclass, but you don’t need to deal with that in this First Look. The HandleCorsRequest parameter specifies whether browsers should allow Cross-origin Resource Sharing (CORS), which is when a script running in one domain attempts to access a REST service running in another domain, but that is also an advanced topic. There are no parameters. Whenever this method is called it executes an SQL statement that selects all records from the demo.coffeemaker database. For each record in the database, it appends the values to an array as name, value pairs. It converts the array to JSON and returns the JSON to the calling application by writing the JSON out to stdout. Finally, it quits with a success. First it tests if the payload contains a valid JSON object by calling the GetJSONFromRequest() and ValidateJSON() methods defined later in the class. Then it uses the JSON object to create a new demo.coffeemaker and then saves the record in the database. It returns the status by writing it to stdout. Getting any parameter as a call argument. Accessing the payload through obj value. Returning the response to the client application by writing it to stdout. This section shows you step-by-step how to use the coffee maker application to handle REST calls. It starts with getting your system ready, including downloading the sample code from github, and takes you through the steps required to build the code and create the environment in the Management Portal. Install a REST API application on your local machine, such as Postman, Chrome Advanced REST Client, or cURL. You will use it to generate test REST HTTP commands to show that your REST interfaces are working. Clone or download the FirstLook-REST sample code from github: https://github.com/intersystems/FirstLook-REST. This sample demonstrates REST APIs for a coffee maker database. Go to https://github.com/intersystems/FirstLook-REST in a web browser. Using a text editor, open the README.md file and follow the instructions in it. The Management Portal URL for the instance is displayed when you first connect to the node using SSH, and can be displayed at any time by entering iris info on the Linux command line. Log in using one of the predefined user accounts and the new password you provided when changing the password. For more information, see Changing the InterSystems IRIS Password on the Linux Command Line in Connecting to InterSystems IRIS in the Cloud. On a Windows system, you can open the Management Portal by clicking the InterSystems IRIS icon in the system tray. On any system, you can use the URL http://host:port/csp/sys/UtilHome.csp, where host is the IP address or DNS name of your system and port is the web server port number of the instance, which is 52773 by default, for example http://localhost:52773/csp/sys/UtilHome.csp. Log in using one of the predefined user accounts with the password you provided during installation, or another you created. 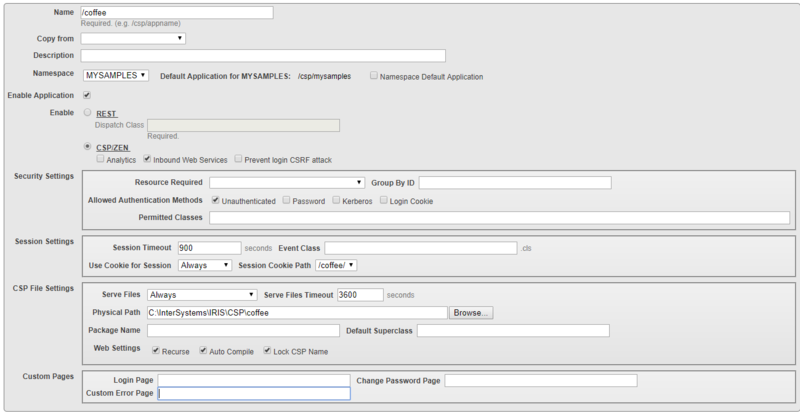 Select a namespace, such as a namespace, MYSAMPLES, that you have created. Then create a web application to contain the application. This is not the web application that will process the REST requests. Now create a second web application. This is the one that handles the REST calls. Name: /rest/coffeemakerapp  this specifies the URLs that will be handled by this web application. InterSystems IRIS will direct all URLs that begin with /rest/coffeemakerapp to this web application. Dispatch Class: Demo.CoffeeMakerRESTServer  this is the class that defines the URLMap. Allowed Authentication Methods: select both Unauthenticated and Password check boxes. URL: http://server:port/rest/coffeemakerapp/newcoffeemaker, where server is the IP address or DNS name of the system hosting the InterSystems IRIS instance, and port is the web server port of that instance. Login credentials for the InterSystems IRIS instance. The IP address of the cloud node and web server port of the instance are displayed when you first connect to the node using SSH, and can be displayed at any time by entering iris info on the Linux command line. The credentials are one of the predefined user accounts and the new password you provided when changing the password. For more information, see Changing the InterSystems IRIS Password on the Linux Command Line in Connecting to InterSystems IRIS in the Cloud. Use the IP address or DNS name of the system the instance is running on, or localhost if it is installed locally. IRIS installation sets the web server port number to 52773 by default; you can determine the port number of your instance by opening the Management Portal and noting the port number in the URL, or navigating to System Administration > Configuration > Additional Settings > Startup. For credentials, use one of the predefined user accounts with the password you provided, or another you created. When you provide REST interfaces to developers you should provide documentation so that they know how to call the interfaces. You can use the Open API Spec to document REST interfaces and a tool, such as Swagger to edit and format the documentation. InterSystems is developing a feature to support this documentation. This release contains a feature in API Management that generates the document framework for your REST APIs. You still need to edit the generated documentation to add comments and additional information, such as content of arguments and HTTP return values. Setting Up RESTful Services is an InterSystems online class that uses the same coffee maker application as this First Look, but goes into more detail. You need to be logged into learning.intersystems.com to take this course. If you don’t have an account, you can create one.